Tran Thi Tu from Vietnam takes the cake at AirAsia Runway Ready Designer Search 2017. One of the prizes include a confirmed slot to showcase her new collection at KL Fashion Week 2018. The winning collection drew inspiration from Hanoi, Tran’s hometown, and traditional Vietnamese Bat Trang ceramics. MANILA, Philippines — When you travel to Kuala Lumpur, it’s either you’re there to experience the culture, to try out its multi-ethnic culinary heritage or to feast your eyes on one of AirAsia’s promising designers. Whatever it is, trust that this design competition exists to exceed expectations. It’s been over a year since Thai designer Anurak Jaidee took home the coveted title as AirAsia’s Most Promising Designer. Now in its third iteration, the annual design competition has grown from selecting young talents from five countries, expanding its search now to 10 countries. The pursuit to crown the next title-holder kicked off in April in Manila before moving on to Bandar Seri Begawan, Kuala Lumpur, Singapore, Ho Chi Minh City, Yangon, Jakarta, Bangkok, Vientiane, then concluding in Phnom Penh in June. In conjunction with Kuala Lumpur Fashion Week, the collaboration with the largest low-cost carrier in Asia paves the way for Malaysia to be the next fashion hub of Southeast Asia. What makes this competition exciting is the opportunities that the winner can walk away with. Think prizes worth at least P4 million, the production of their capsule collection to be sold on FashionValet, a six-page fashion spread in AirAsia’s Travel3Sixty inflight magazine, a pair of AirAsia return flights, and a confirmed slot to showcase at KL Fashion Week 2018. All that to give a budding designer a chance to show that they’ve got what it takes. For the finale, two aspiring designers per country were selected to showcase an ASEAN-themed three-piece collection, and out of the 20, only one earned the winning title of AirAsia Runway Ready Designer Search 2017 — Tran Thi Tu. The victor represented her country Vietnam with a collection inspired by her hometown of Hanoi. More specifically, her designs were inspired from traditional Vietnamese Bat Trang ceramics, which was seen with her play with surrealism patterns and textures. During the interview, the designer spoke about her struggles with the collection, and also when it came to sourcing her materials. Living on the northern side made it difficult for her to search for the right fabric therefore she had to source her textile down south. When asked what she thought was the strongest point of her collection, her response was the pattern and fabric that she used. The 24-year-old Tran presented elaborate designs heavy in hand-embroidered patterns, and patches of glimmering beadwork. The silhouettes were reminiscent of Vietnam’s age-old fashion, and not to mention the styling of the pieces didn’t at all deem disparate. The Filipino finalists who represented the Philippines were Esme Palaganas and Jerome Tayao. The two contestants presented collections that were their own take on ready to wear. Opening the show was Jerome of Fashion Institute of the Philippines. His lineup was anything but subtle as the key reference for his collection is one of our country’s own gems — the coral reefs of Coron. Entitled “Colors of Coron,” the lineup presented bold tones accompanied by appliques of corals and fishes. Just like his hues of choice, he kept his silhouettes playful with his execution of puffed sleeves and frilly collared blouses. Meanwhile Esme, an alumni of De La Salle College of St. Benilde, showcased a collection that was entitled “Hagdan.” Deeply inspired by her family trips to the rice terraces of Luzon, her lineup focused on layering with stripes, and adding an ornamental flare of fringe to the mix. This gave her silhouettes movement and life as the models strutted down the runway. The color palette was mostly understated and monochromatic, but the hint of teal gave the three-piece collection a richer feel. The design search’s main initiative is to help empower the youth and to develop young talents in the fashion industry across the region. This year’s panel of judges for the Grand Finale included judges from all ASEAN countries, as well as Aireen Omar, CEO of AirAsia Berhad; Andrew Tan, founder of KLFW RTW; and Vivy Yusof, co-founder of FashionValet. “As a truly ASEAN airline, we are proud to continue our initiative through this platform and expand the designer search to a regional level with talents from all 10 ASEAN countries. We are very impressed with what we’ve witnessed on the runway today. ASEAN has great potential and we believe that, with continuous support and guidance from fashion industry leaders, business owners as well as members of the media, the fashion industry can flourish across the region,” AirAsia CEO Aireen Omar explains. After witnessing what the ASEAN community has to offer for the second time around, it’s hard not to be excited for the next AirAsia Runway Ready Designer Search to see what other brewing talent will emerge. 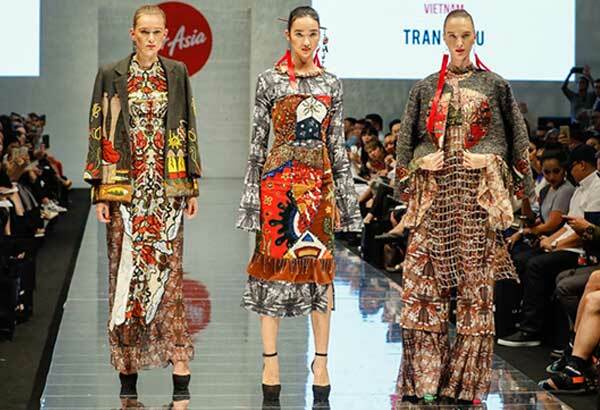 Each year, the designers just keep getting better, and it’s safe to say that AirAsia plays a big role in the development of the fashion industry of Southeast Asia. So for now, we’ll just enjoy and sit tight till the next batch of designers rolls in.